1. A reference to the feel or sound of crackling or rattling, or of rough surfaces being rubbed together: The crepitant sound of the virtual DVD of a fireplace which Jim's sister has is realistic; the only thing missing is the warmth. 2. Pertaining to a fine bubbling noise produced by air entering fluid in lung tissue: The most crepitant sounds are heard during pneumonia and in certain other conditions. 3. 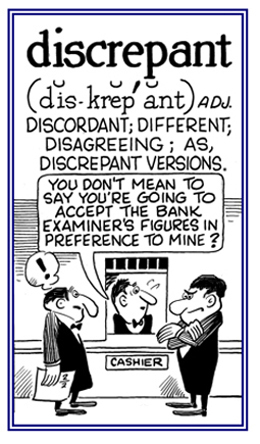 Etymology: from Latin crepitans, "An audible crackling sound." © ALL rights are reserved. An abnormal breathing sound produced at the end of breathing in and caused by air entering a collapsed alveoli (air cells in the lungs) or just collapsed alveoli and atelectasis (collapse of the lung) that contain fibrous exudate (fluid that oozes out of blood vessels because of inflammation and which is deposited in nearby tissues): "Crepitant crackles occur in pneumonia, tuberculosis, and pulmonary edema." 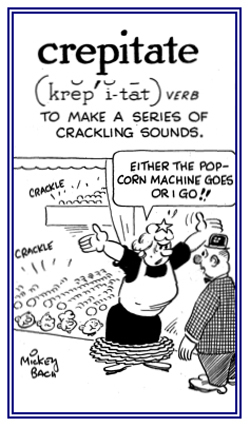 To make crackling, popping, or grating sounds: It is easy to hear the popcorn crepitating as it is heated and prepared for eating. © ALL rights are reserved. 1. A clinical sign in medicine characterized by a peculiar crackling, crinkly, or grating feeling or sound under the skin, around the lungs, or in the joints: "Crepitus is associated with gas gangrene, rubbing of bone fragments, air in the superficial tissues, or crackles of a consolidated area of the lungs in pneumonia." "Crepitus in soft tissues is often a result of gas, most often air, that has penetrated and infiltrated an area where it should not normally be; as for example, the soft tissues beneath the skin (a condition called subcutaneous emphysema)." 2. Clicking sounds often heard in the movements of the bone joints; for example, in temporomandibular joints (of the lower jaw) resulting from joint irregularities: "Some crepituses conditions are caused by tissues rubbing together in abnormal ways." "The most common causes of these types of crepituses are arthritides or joint injuries." "Other common causes of crepituses exist when air gets inside soft tissues, which can cause crackling or popping sounds when pressed and the most important causes of these types of crepituses are holes in the airways or guts or anaerobic bacterial infections." 3. Flatulence or the noisy discharge of fetid gas discharged from the intestine: "This particular form of crepitus is considered to be a shorter version of crepitus ventris, "sound made by the belly". 4. 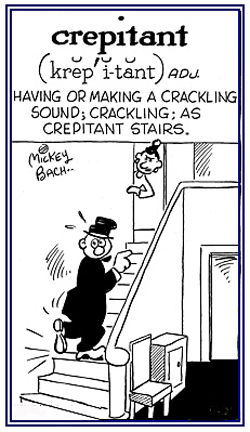 Etymology: from the Latin crepitus, "a crackling sound" or "a rattle"; from Latin crepare. "to crack, to creak". Descriptive of not being in agreement, not in accord with another version, or not compatible with other facts or data: When the two cars drove into each other, the two witnesses, who were waiting on one side of the street and saw the incident, gave two different or discrepant accounts of how the crash took place. © ALL rights are reserved. Nearly or faintly heard or the sounds of fine bubbling noises: "The doctor's stethoscope indicated subcrepitant sounds from the patient's lungs which were possibly from pneumonia." A sound approaching sharp or snapping noises.